Frederick Community College. In the theater. C.M. Mayo to read from and discuss Mexico: A Traveler's Literary Companion, her collection of Mexican literary writing. Panel Discussion: "Mexico in Mind: Literary Impressions of a Distant Neighbor"
Room E2.010 of the Texas State Capitol (the E stands for Extension  the renovation of the Capitol that took place in the 1990s). The Capitol is at 11th & Congress Avenue. C.M. Mayo with Katherine Oldmixon, Maria Finn, and Jeff Biggers. Book signing to follow in the book signing tent. Room E2.012 of the Texas State Capitol (the E stands for Extension  the renovation of the Capitol that took place in the 1990s). The Capitol is at 11th & Congress Avenue. C.M. Mayo with Ricardo Ainslie, Maria Finn, and Patricia Quintana. Book signing to follow in the book signing tent. C.M. 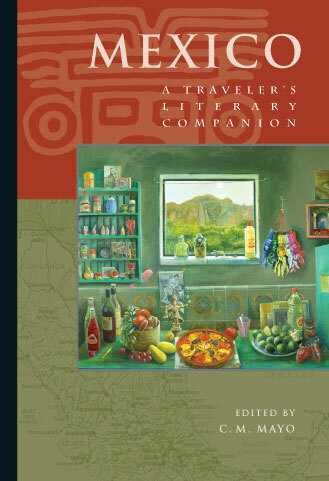 Mayo to read from and discuss Mexico: A Traveler's Literary Companion; Miraculous Air: Journey fo a Thousand Miles through Baja California the Other Mexico; and Tameme. C.M. Mayo to lead the literary travel writing workshop. Featured writers include Jane Smiley, A. Scott Berg, and many others. C.M. Mayo's Special One-Time Literary Travel Writing Workshop (via The Writers Center). Click here for a full descripion of this workshop and to sign up. C.M. Mayo to present Mexico: A Traveler's Literary Companion. 5625 Connecticut Ave, just one block north of Chevy Chase Circle. C.M. Mayo and others celebrate Mexico's Day of Independnce (Sept 15th) with reading and discussion of works on Mexico. Details to be announced. San Miguel Author's Sala. C.M. Mayo will read from Miraculous Air and Mexico: A Traveler's Literary Companion (the other reader will be Joseph Dispenza). Click to read more about San Miguel Author's Sala. Posada San Francisco, Plaza Principal 2,on the corner of Calle San Francisco & Calle Hidalgo across from the Jardin. Cost: 50 pesos. Museo de Arte de Queretaro. C.M. Mayo, editor; Mexican writer Araceli Ardon; and Mexican literary critic Maria Teresa Azuara will present Mexico: A Traveler's Literary Companion. Antiguo convento de San Agustín, Allende 14 Sur, Centro Histórico. Reception following. C.M. Mayo will presen and read from Mexico: A Traveler's Literary Companion For more information, click here. C.M. Mayo's "Literary Travel Writing Workshop"
A special one-time three hour workshop. 1-4 pm The Writers Center. Take your travel writing to another level: the literary, which is to say, giving the reader the novelistic experience of actually traveling with you. For both beginning and advanced writers, this three hour workshop covers the techniques from fiction and poetry that you can apply to this specialized form of creative nonfiction for deliciously vivid effects. For more information and to register, click here. Kensington Row Bookshop Poetry Reading Series, 7 p.m.
C.M. Mayo and Robert Giron, featured readers. The Kensington Bookshop is on Kensington's Antique Row, at 3786 Howard Avenue, just east of Connecticut. C.M. Mayo will be participating on a panel on commentary and essay writing. Cafritz Conference Center, George Washington University's Marvin Center, 800 21st St. N.W. To register, just go to http://www.washwriter.org/conference.html Or call the WIW office at 202-775-5150. Some highlights of the conference are: Keynote Speaker: Brian Lamb, founder and chief executive officer of the C-SPAN television network. Plenary Speaker: Sara Nelson, editor-in-chief of Publishers Weekly and author of So Many Books, So Little Time: A Year of Passionate Reading. 16 breakout sessions: Take your pick from breakout sessions on a variety of writing topics to include some craft sessions and business of writing sessions. A short schedule can be found on the WIW Web site. Agent Pitch Sessions (WIW Members Only): Meet with some of the country's top literary agents for 10-minute pitch sessions and at the Agents Breakfast. Awards Reception: Attend the evening awards reception where Washington Writing Prizes Chair Beryl Lieff Benderly will announce the winners of the 2006 Washington Writing Prizes competition. "HAVING YOUR VOICE HEARD THROUGH COMMENTARY AND ESSAY"
Writing your opinions and life experiences in your own voice can be rewardingand a great marketing toolbut can be hard to sell. At the same time, newspapers, Web sites and radio shows often are in need of opinion writers more than you might think. Moderator: Leslie Pietrzyk is the author of two novels: Pears on a Willow Tree (Avon) and A Year anda Day (William Morrow). Her essays and fiction have appeared in The Sun, The Washingtonian, Gettysburg Review, Iowa Review and many other journals. She teaches in the graduate writing program at Johns Hopkins University and works privately with individuals. Mike Long is an author, essayist, commentator and speechwriter whose work has appearedeither under his name or ghosted for his many political and business clientsin numerous newspapers, magazines and Web sites including The Weekly Standard, National Review, New York Daily News, Newsweek Interactive, the Washington Post, the Wall Street Journal, the Los Angeles Times and USA Today. Hes the creator of the syndicated feature, Too Tough for TV: Rejected Jokes of the Late-Night Comics at www.inopinion.com and has been a contributing editor for culture at the Washington, D.C., Examiner newspaper. C.M. Mayo is the author of Miraculous Air: Journey of a Thousand Miles through Baja California, the other Mexico ; and Sky Over El Nido, which won the Flannery O'Connor Award for Short Fiction. Her many other awards include three Lowell Thomas Awards for travel journalism and a WIW Award for Best Personal Essay. She is also the editor of an anthology of Mexican fiction and literary prose in translation, Mexico: A Traveler's Literary Companion. Mayo divides her time between Mexico City and Washington, D.C., where shes on the faculty of the Writers Center. Bill OSullivan is a features editor at The Washingtonian, where he edits both freelancers and staff writers. Hes published his own essays and commentaries in The New York Times, Newsday, the Washington Post, the Washingtonian, National Geographic Traveler, and the North American Review, among others. His work has been cited three times among the notable essays of the year in The Best American Essays. OSullivan teaches the personal essay at the Writers Center in Bethesda. "A Literary Look at Mexico" Cosponsored with the Cultural Institute of Mexico and Smithsonian Latino Center. Reception with Light Refreshments, 7:15 p.m. Mexicos rich literary tradition is the focus of an evening with C.M. Mayo and Luis Alberto Urrea and C. M. Mayo, moderated by Ray Suarez, senior correspondent of The NewsHour with Jim Lehrer. Mayo is the editor of Mexico: A Travelers Literary Companion, a panoramic vision of Mexico through the short stories of some of its finest contemporary writers of fiction. She is the author of the widely-lauded travel memoir, Miraculous Air: Journey of a Thousand Miles through Baja California, the Other Mexico, and Sky Over El Nido, which won the Flannery O'Connor Award for Short Fiction. As well as the founding editor of Tameme, the bilingual (Spanish/English) Chapbook press. Mayo is also a translator of contemporary Mexican poetry and fiction. Urrea is a prolific and acclaimed writer who uses his bicultural life to explore love, loss, and triumph. His novel The Hummingbirds Daughter pays tribute to his beloved ancestors and the vibrant heart of all things Mexican against the backdrop of 19th-century historical realities. Urrea, a critically acclaimed author of 11 books, is an award-winning poet and essayist. The Devil's Highway, his 2004 non-fiction account of a group of Mexican immigrants lost in the Arizona desert, won the 2004 Lannan Literary Award and was a finalist for the Pulitzer Prize and the Pacific Rim Kiriyama Prize. Location: Cultural Institute of Mexico, 2829 16th St., N.W. Cost: A limited number of free seats are available to those who reserve directly through the Mexican Cultural Institute, tel. 202-728-1675 or 728-1681, or e-mail institutomexicodc@sre.gob.mx For more about the Instituto de Mexico, click here $15 for members of the Resident Associates Program and the Smithsonian Latino Center. Visit the Smithsonian Resident Associate Program Web Page. 10: 30 am. C.M. Mayo will sign El cielo de El Nido, her book of short stories (Sky Over El Nido) translated into Spanish by Mexican poet and writer Agustin Cadena. These are stories from Sky Over El Nido (Flannery O'Connor Award for Short Fiction) plus five new stories. C.M. Mayo's One Day "Revision Workshop" 10 am - 4 pm (hour break from 12-1) The Writers Center, Bethesda, MD. For fiction and creative nonfiction writers with a completed draft of a short or book-length work, this one day workshop covers the fundamentals of revision, specifically, examining beginnings; plot points; endings; use of detail; dialogue; rhythm and sound; cutting clutter, and more. We will not be sharing any manuscripts; however, to make the most of this workshop, bring your manuscript. The goal is for you yourself to be able to identify what needs revision in that mansucript, and, after the workshop, to help make your revision process both more enjoyable and more effective. To register, click here. their poetry of foreign places. For more information please contact Cliff Bernier. Reading and Book Signing, 7-8 pm, The City Clyb of Washington at Franklin Square, 1300 "Eye" St NW Washington DC. Mexico: A Traveler's Literary Companion. The Tiffany Room at the Arlington Arts Center, 7-9 pm C.M. Mayo, Grace Cavalieri, Rei Berroa, Jacqueline Jules and Robert Giron to read from their work in the anthology by Robert Giron, Poetic Voices Without Borders. The Tiffany Room at the Arlington Arts Center, is across the street from Virginia Metro Center Exit on Wilson Blvd in Arlington. Sponsored by the Womens National Book Association-DC Chapter and the Arlington Arts Center. 12-1:15 pm "Crossing Americas" C.M. Mayo will participate on panel. Moderator: Diane Thiel. 3-4:15 pm "Mother Countries/ Other Countries: Imagined Geographies" C.M. Mayo will participate on panel with Ruth Knafo Setton, Jessica Treat, Janice Eidus and Ilya Kaminsky. Also, C.M. Mayo will be at the bookfair for Tameme. Ida Victoria Arts, the hottest new art gallery in Los Cabos. Sponsored by Baja Books & Maps. Click here for the full line-up! The Writers Center: Panel Discussion on Literary Translation. From 2- 4 pm. The Writers Center, 4508 Walsh St, Bethesda MD tel. (301)-654-8664 www.writer.org With C.M. Mayo, Barbara Goldberg, Vladimir Levchev, and Yvette Neisser. For more information and to register, click here. The Inaugural Reading for "A Space Inside" at Riverby Books. New Reading Series for DC Writers. @ 7 p.m. C.M. Mayo will read from "The Building of Quality" a short story that was recently published in the Kenyon Review. Riverby Books, 417 East Capitol St SE, just north of the Eastern Market and four blocks east of the U.S. Capitol. A seller of used and rare books, Riverby Books is open from 10 am - 6 pm and can be reached at (202)543-4342. Read an interview with C.M. Mayo in Hill Rag. "From Prose to Publication: The Reality of Fiction Writing"
"Literary Travel Writing" special one-time three hour workshop. 1pm -4 pm Take your travel writing to another level: the literary, which is to say, giving the reader the novelistic experience of actually traveling with you. For both beginning and advanced writers, this three hour workshop covers the techniques from fiction and poetry that you can apply to this specialized form of creative nonfiction for deliciously vivid effects. For more information and to register, click here.For more about the Writers Center, click here.